Hong Kong plans to build one of the world's largest artificial islands with an eye-watering $79 billion price tag, city officials said today. The government's HK$624 billion proposal to reclaim 1,000 hectares (2,471 acres) of land around the territory's largest island, Lantau, has been touted as a solution to the pressing housing shortage in the city. Hong Kong is notorious as one of the least affordable markets on the planet. The artificial island - the city's most expensive infrastructure project to date - would be four times the cost of building Hong Kong International Airport, which opened on Lantau in 1998, and far outstrip Dubai's famous palm-tree shaped Palm Jumeirah, which reportedly cost $12 billion to build. The man-made island would be nearly three times the size of New York's Central Park and provide up to 260,000 flats, more than 70% of which would be used for public housing, the government has said. It has been estimated that the cost of the project could balloon to more than $112 billion by 2025, when reclamation work is expected to start. 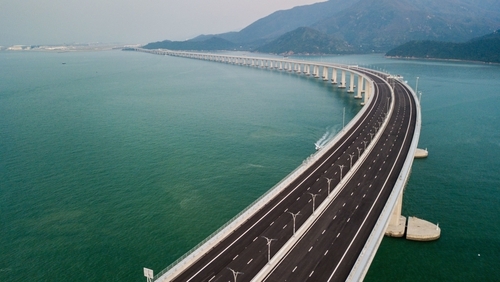 Lantau island is also home to a new mega bridge launched last year - billed as the world's longest sea bridge - connecting Hong Kong to neighbouring Macau and mainland China. The opening of the bridge comes at a time when Beijing is seeking to tighten its grip on its semi-autonomous territories.